A few weeks back at my class reunion, an old classmate asked me for my thoughts about the most interesting trends in the audio industry at the moment. Honestly, I didn't have a very satisfying answer at the time. But the more I think about it (and the more I sober up), I wish I had said this: the thing I'm noticing more and more frequently these days is angry old men yelling at the millennial crowd about how their crappy taste in audio gear is killing the hi-fi market. If it sounds like I might be talking about you, bear with me for a moment. Don't put your grumpy face on just yet. Think about it for a sec. For all of the castigation that we're piling on younger listeners for the way they're destroying our favorite hobby, how many hi-fi manufacturers are stepping up to embrace the way that music is actually consumed these days and elevate that experience, rather than offering gear with oodles of connectivity that many people don't want or need? Mind you, millennials aren't a monolith. Some of them really do enjoy "our way" of enjoying music in and around the home; but, for those of any generation whose music libraries reside primarily on their phones (if they own it at all), how many audiophile companies are trying to embrace them rather than merely tell them they're doing it wrong? As far as I can tell, it's a pretty short list. Bowers & Wilkins comes to mind with its mobile headphones and wireless speakers. There are a few others, and I'm sure we'll hear about them in the comments section below. My point isn't that there are no exceptions, though; it's merely that the exceptions are too few. Now, though, as Yoda would say, there is another: another hi-fi company embracing the present day in a really simple, straightforward way. Paradigm recently introduced its Premium Wireless Series, which joins the slowly growing ranks of wireless multi-room music systems based on DTS Play-Fi. If you're not familiar with Play-Fi, it's easiest to think of it as a sort of open-platform alternative to Sonos. A good number of manufacturers--from Definitive Technology to Polk to Wren to CORE Brands--have adopted the Play-Fi standard and are cranking out some surprisingly good wireless speakers that can all be integrated together and controlled with the same Play-Fi app for iOS, Android, or Windows PC. In other words, unlike Sonos, you could have a Def Tech wireless speaker in one room, a Polk in another, a Paradigm in the third, etc., all working together pretty much seamlessly. And unlike AirPlay, you're not limited to one mobile ecosystem. Furthermore, you avoid the compression of Bluetooth. So, what makes the Paradigm PW AMP stand out in that pack? A few things, actually. Firstly, it allows you to bring your own speakers to the Play-Fi party, which is still pretty rare at this point among the lineup of available Play-Fi products. Paradigm rates its Class D output as two x 200 watts dynamic peak; two x 100 watts RMS into four ohms, and it's compatible with four-, six-, and eight-ohm speakers, which means it's capable of driving just about any speakers you'd want to pair with it. Secondly, and perhaps most importantly, it features Anthem Room Correction, as do all of Paradigm's Premium Wireless Series products, which means that you can dial in its performance to the exact acoustical quirks of your room, with a startling degree of flexibility. Out of the box, the Paradigm PW AMP is a pretty unassuming little device, measuring just a hair over three inches tall, a little under six inches wide, and right at 8.6 inches from front to back. It's a stylish little bugger, though, with a nice mix of gloss and satin accents, gracefully curved corners, and a pretty simple five-button control layout up front. Around back, it features an Ethernet port, analog RCA inputs, a subwoofer out, and two USB ports (neither of which can be used for streaming audio), along with two sets of speaker outputs. If I have a nit to pick with the design of the PW AMP at all, it's with the latter. Instead of nice five-way binding posts that would match the quality of the amp overall, we get spring-loaded terminals whose caps can be removed if you want to opt for banana plugs (guilty as charged). That's a subjective grump, though. That aside, the PW AMP is a beautifully built little device. Physical setup is exactly as straightforward as you might expect, although I did go through the process a number of times just to try out the PW AMP in as many ways as possible. My primary setup consisted of the amp connected to a pair of GoldenEar Triton One towers via a pair of Kimber Kable 12TC speaker wires. Paradigm also sent along a pair of its exceptional Prestige 15B bookshelf speakers, which I hooked up using the same cables, along with an Artison RCC Nano 1 subwoofer, connected using a run of custom-shielded RCA cable whose maker I've honestly forgotten. With that done, I ran through the wireless setup process once just to get a feel for it and to do a little wireless listening, but shortly thereafter I ran a direct Ethernet connection to the PW AMP for the duration of my testing. I listened to the PW AMP for a few days before running Anthem Room Correction two different ways on both of the different speaker setups. Room correction is performed using the same ARC 2 software you'd use to set up one of Anthem's MRX Series receivers. If there's any difference worth noting, it's that the microphone shipped with the Premium Wireless Series speakers is a little smaller than the one included with Anthem gear. Other than that, if you're familiar with ARC, there are no surprises here. I mean, unless you consider the fact that a $499 wireless amp comes with the same room-correction capabilities as much more expensive receivers and preamps, not a gutted, scaled-down version thereof. That's a bit of a shocker. If you're not familiar with Anthem Room Correction at all, though, here's the basic rundown. 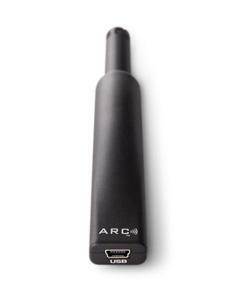 The ARC 2 software installs on your Windows PC, and the included microphone attaches to the same via USB. With both the PC and PW AMP (or any other Paradigm Premium Wireless speaker) connected to the same network, you use ARC 2 to measure the speakers (a pretty quick process in stereo), set your target room-correction parameters (or just let the software do the decision-making there), run some automated calculations, then upload the results. As for the sorts of decisions you can make about the target parameters: in a simple two-channel stereo setup, you can adjust the high-pass filter (with your choice of anything between 1st- and 6th-order) anywhere between 20 and 200 Hz in 1Hz increments, or you can leave it flat. You can also adjust the Max EQ frequency between 200 and 5,000 Hz. Add a subwoofer to the mix, and ARC 2 also gives you a fine level of control over bass management, as well as allowing you to set a Minimum Subwoofer EQ frequency. At first I chose to approach the ARC 2 setup of the PW AMP as I would a home theater system, setting the Max EQ frequency to 500 Hz to account for a bit of a spike centered around 350 Hz in my two-channel listening room. After a bit of listening to both speaker systems equalized as such, I went back and ran Anthem Room Correction again, this time allowing the software make it own decisions (the biggest difference being a Max EQ Frequency of 5,000 Hz, the default), just to gauge what I feel most listeners will hear when they set up the PW AMP at home.